Maureen Nollette's work, part of the "Michigan Artists Series," elevates ordinary materials into a quiet strength that speaks to women's work and forces the viewer to notice their value. Tues, Wed, Fri: 10 a.m.- 5. p.m.
Thurs: 10 a.m.- 9 p.m. 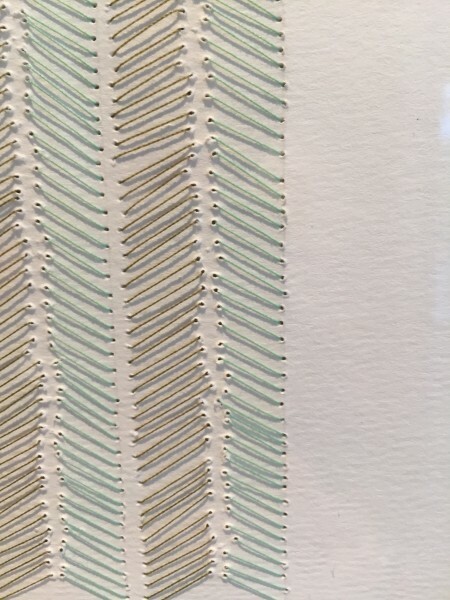 Sat: 10 a.m.- 5 p.m.
Maureen Nollette's work was featured previously on The Rapidian for her inclusion in the show "(a)wake," a group exhibition made entirely of women artists. 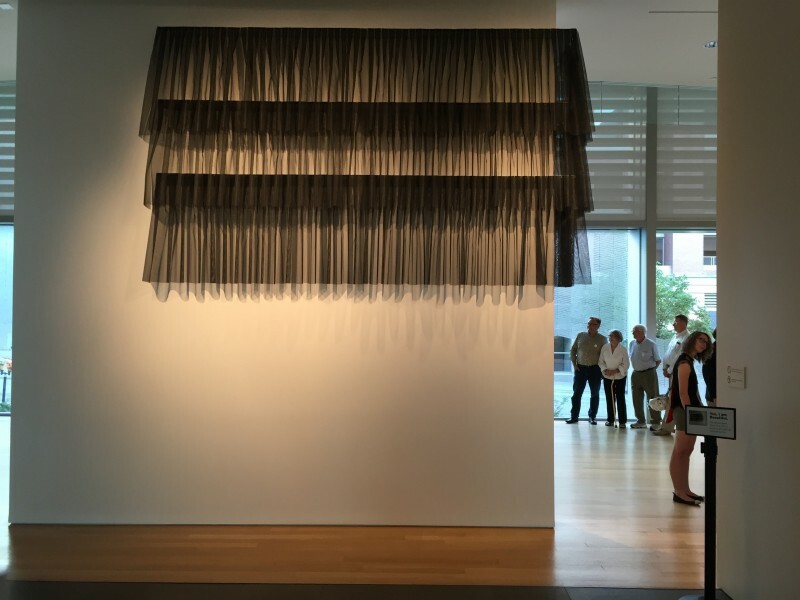 There are too many details to share about Maureen Nollette's new show at the Grand Rapids Art Museum (GRAM), "Honorable Ordinaries." How do I explain this newest in the GRAM's "Michigan Artists Series?" 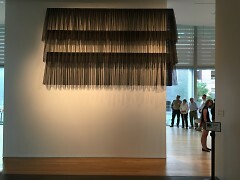 I could tell you about the centerpiece of the show, "box pleats," made of fiberglass mesh, the stuff you replace torn screens with, transformed into elegant form, like expensive curtains. It is almost floating, almost ominous, the way it wraps around the wall without seeming to touch it. The black material (a departure from Nollette's normally pale color palette) is large and foreboding but delicate and light at the same time. I could tell you about the chevrons on the windows in "with/without." I could talk about the way chevrons remind us of military recognition, proudly displayed on the arm, or their symbolism of protection or home. I could talk about the way they play with the light, shifting shadows at different times of the day or weather. I could tell you about the way they interact with the nature outside the windows, or the way they give a nod to the Ellsworth Kelly work in the entrance directly opposite of them in the museum. I could tell you about the woman who touched the plaster ruffles to figure out what they were, despite the wire rope along the floor and signs everywhere to not touch. 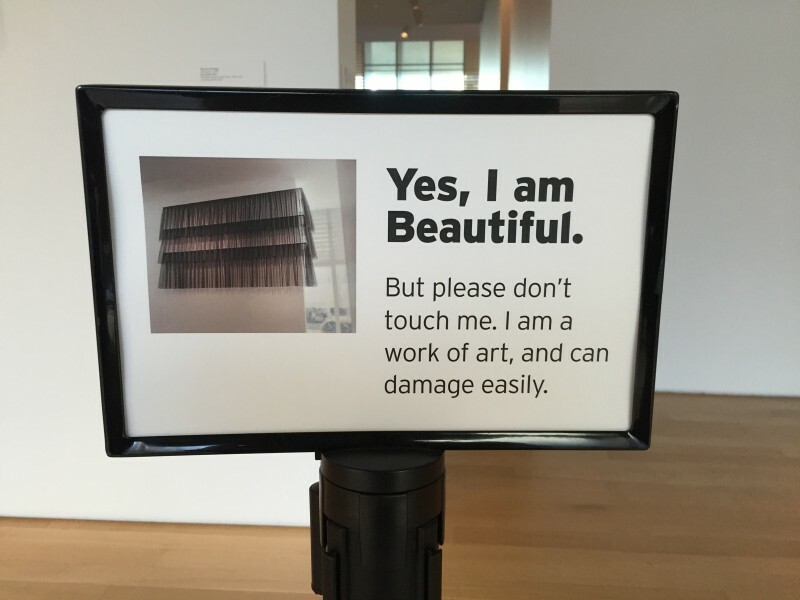 I could wax on about our curiosity and need to Know What It Is, or perhaps our obliviousness (I might even say flagrant disregard if I am feeling ill at ease with the state of humanity) that blinds us to the need for respecting other people's work. I could give a nice segue from that into the subject of much of Nollette's work: women's work, traditionally feminine craft as well as all the cleaning and cooking and childrearing and dishwashing so often relegated to the wife and mother. I could say how again the chevrons, though more minimal than past imagery, still speaks to the need to honor the work of women, the work that so often goes unrecognized but, as Nollette says, deserves its own chevrons on our bodies- a sign of our dedication and honor. But what stays with me most was tucked away in a corner, a framed work on paper called "over/under." 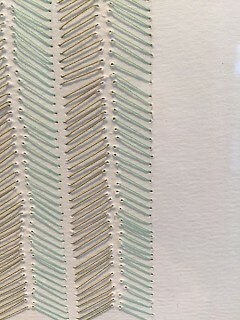 Again chevrons but this time small pale stitches, in out in out, thread through paper. The natural optical illusion possible from a chevron pattern is intensified, almost convincing the viewer that paper is surely folded in little peaks across the plane, thanks to the mark-making of a needle passing through paper. Have you ever noticed the way a stitch leaves its path perfectly highlighted in paper? You see which direction the needle passed through. It is a record of the act of making. The little hole is a record of repeated effort, over and over, in out in out. They breathe in and out, a meditative work much like dishes, or cleaning the counter or putting my son to bed and hearing his breathing slow as he falls asleep. The repetition of women's work so often goes unrecognized. These marks, marks of time and effort made by the passing of a needle, draw my attention. These intricate little acts tucked in a corner beg me, the viewer, to notice the attention and care given to their creation. I read recently that women say that, more than anything else in a relationship, they want to be noticed. Of course that's data and maybe you or I have our sights set higher than being noticed, but it certainly is a marker of our patriarchal structure that this desire is so prevalent in women today. Today, even, women too often don't even feel noticed. Forget equality, recognition, honor. Can we start with just being noticed? This show, about women's roles and women's work and the honor and recognition they deserve but so rarely get, asks to be noticed. It's not shouting or pushy. It's beautiful, subtle, often almost quiet. It's not cloying or obvious but still references traditionally feminine forms and materials. You don't have to be an art historian to discover the symbolism and feel the weight of its meaning. 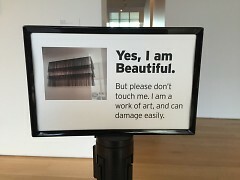 Its strength is in its ability to pull us in, to notice the hand that made it, to notice the lack of machine perfection. The show, as well as the artist's work of the past, has a quiet strength that is hard to ignore. Nollette's work certainly doesn't yell at us- but here we are, noticing, recognizing. Pay attention, it whispers. This women's work is of infinite beauty and importance.